After a few non stop weeks of guiding, we decided that 10 days in June would be set aside for some exploration of new areas we had been eyeballing on Google earth. 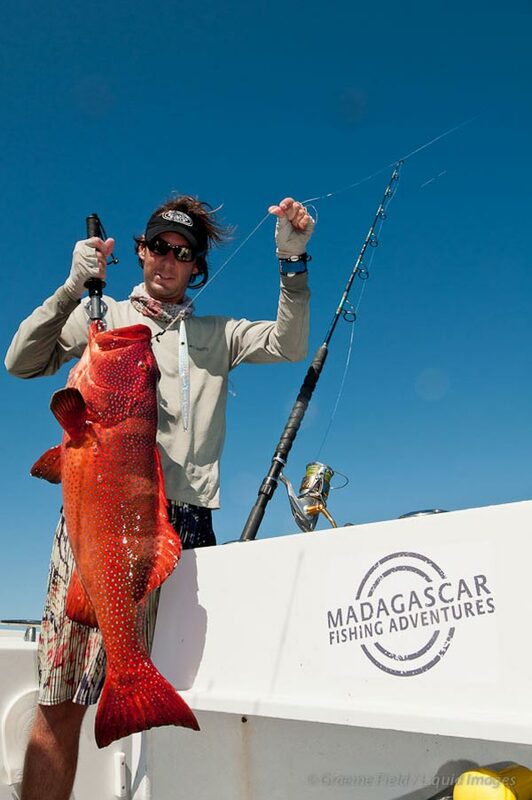 Plans were quickly made, and intrepid adventurer Ryan Hart and I hopped over the Mozambique channel to meet up with Ankofiamena Bay Guesthouse manager Jason Sheppard, and Madagascar Fishing Adventures head guide Brandon King. 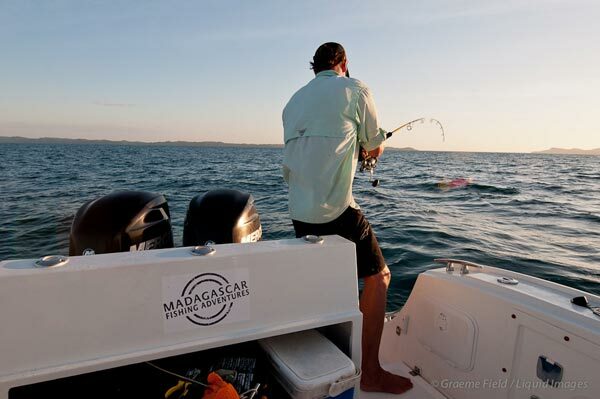 There was nothing luxurious about this trip – the four of us, our fishing gear, camera equipment and enough fuel and supplies for a week were loaded painstakingly onto (and into) “King Julien” – our prized 28ft mono-hull boat. Fully laden we headed off in search of new reefs, new shores and new adventures. In order to conserve fuel and to survey the underwater reefs and drop offs, we spent a lot of the time cruising slowly, stopping every so often when we found something interesting on the sounder or on the surface. 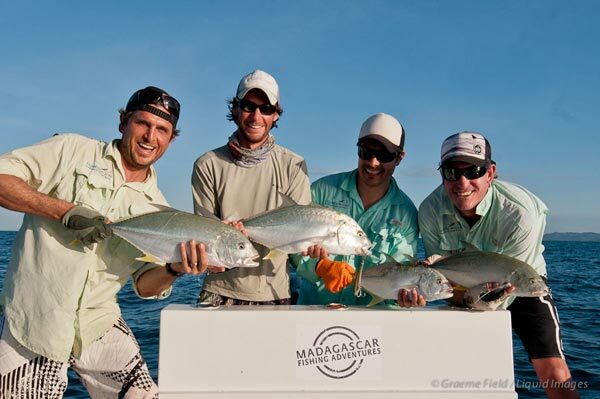 We covered a lot of water in the 5 or 6 days we were on the boat, and found some pretty amazing places, reefs and fishing. We explored only small sections of vast areas of good, shallow reef, and found lots of baitfish congregated around this underwater structure. 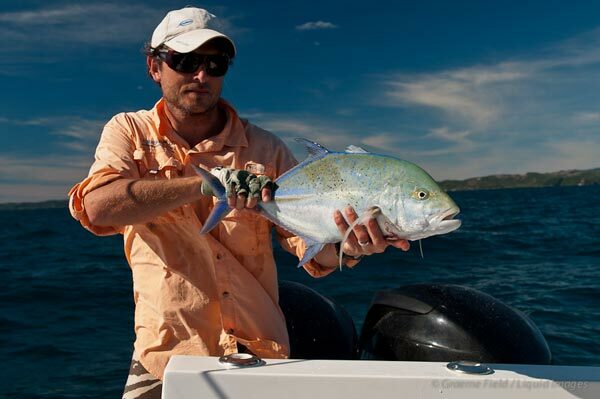 Being fairly shallow, we were able to fish predominantly with surface lures, and took a number of GT's, jobfish and bohar snapper on a variety of poppers and stick baits. There is a lot of area to cover, and we barely scratched the surface of it. The GT's throughout the week were striking a bit short, so we had many chases and fish turning just behind the lure, as well as losing quite a lot of bigger fish that hit the popper but didn't stick for long. I can't wait to fish it in peak GT season! 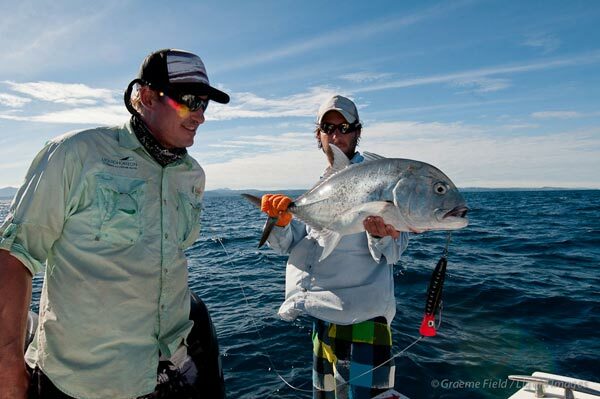 Being able to fish right close to, or from the shore is always a novelty, and most anglers will jump at the chance to fish on foot. 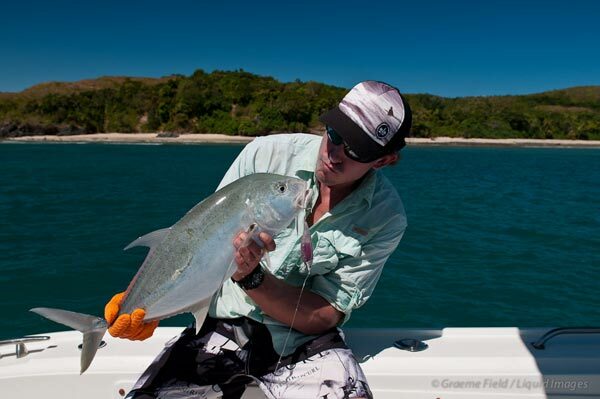 Well, we found a few top quality spots where one can easily fish on foot from rocky ledges or beach, with deep water right at your feet. We elected to fish from the boat, but were drifting right close to the shore and throwing our poppers, spoons and stick baits right up against the rocks. And boy were there fish there! We spent four or five sessions in one particular spot and had crazy action each and every time. GT's, schools of greenspots, good sized river snapper, couta (king mackerel) and some big grouper were smashing our surface lures and we landed some really fun fish. I threw a fly for a bit, and caught a number of greenspot kingies. With the depth of water and congregation of food here, there will be some big fish landed here for sure. There is also a lot of beach and reef and coral heads to explore on foot. 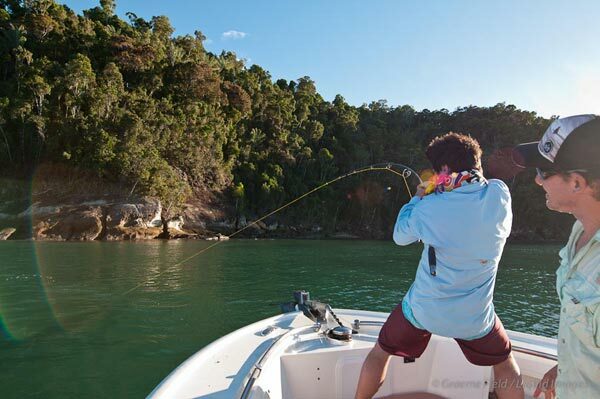 Judging by the fish we caught throwing towards the shore from the boat, there is a lot of fun to be had here, especially on a high tide with a fly rod in hand. 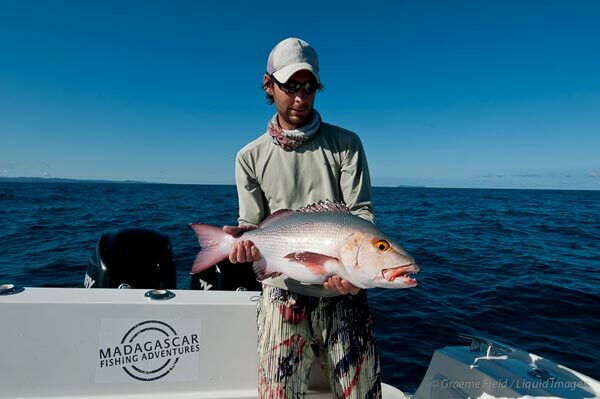 There is also some great mangrove area that produced some nice river snapper on light gear. 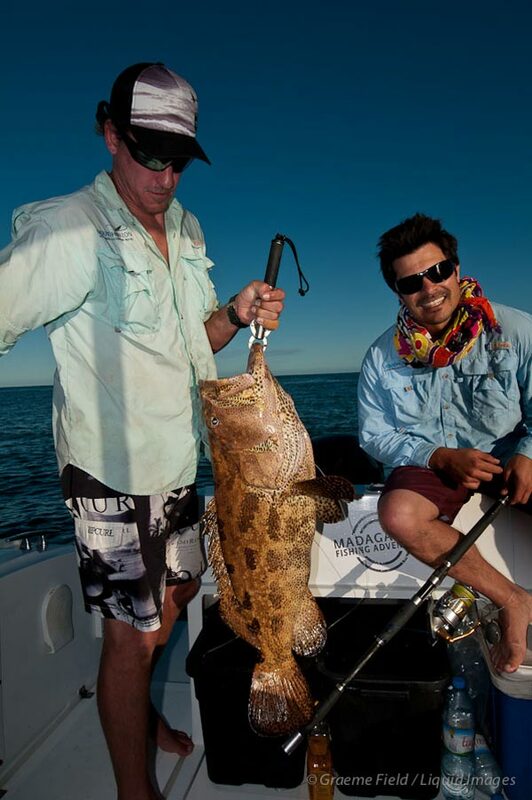 A catch of note was a 30lb grouper caught by Ryan that smashed a surface popper. 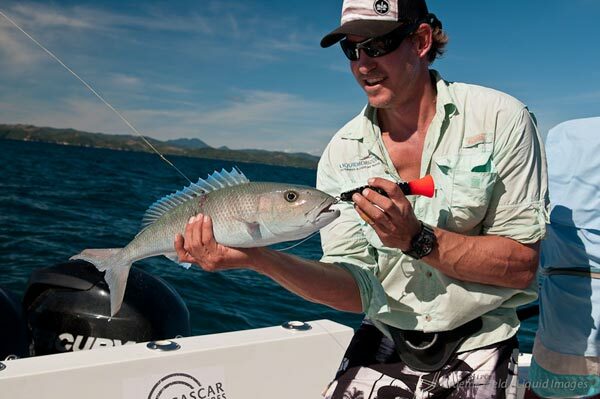 It required some serious pulling and some seriously sneaky tactics to get it out of the reef and up to the boat. 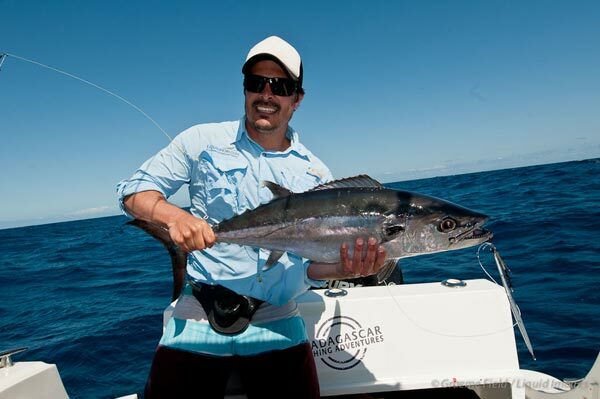 After a lot of huffing and puffing from Ryan, and a lot of unsolicited advice from the rest of us, he succeeded in manhandling this beast out of the reef and into clear water where we could land it. 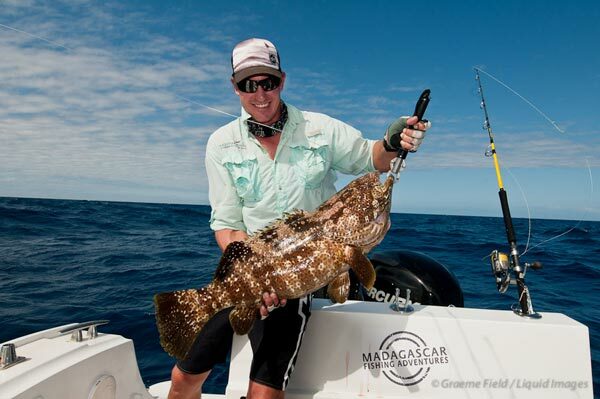 We found another large area that is covered in pinnacles and coral heads, ranging in depth from 8 – 15 meters. 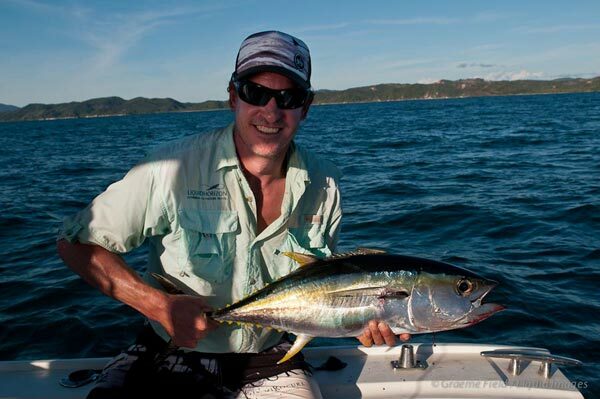 The whole area was full of schools of greenspots and GT's, and we had a crazy afternoon catching heaps of these powerful fish on light gear and surface lures. I lost count of how many triples and quadruples we had on, no one was counting amidst the chaos of endless chases, takes, shouts and laughter! 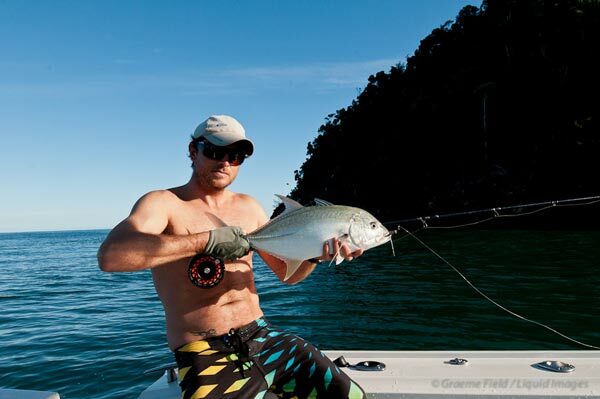 But we landed some great light tackle fish – greenspots and GT's up to 5 kilos, and a couple of GTs around the 10 kilo mark. Although we didn't get round to pulling out a fly rod, this is an excellent fly fishing area – both with a sinking line and with a popper or flipper on the surface. We didn't get any, but it was the perfect area for king mackerel and I'm sure many will fall prey to flies and surface lures when we start spending more time here. 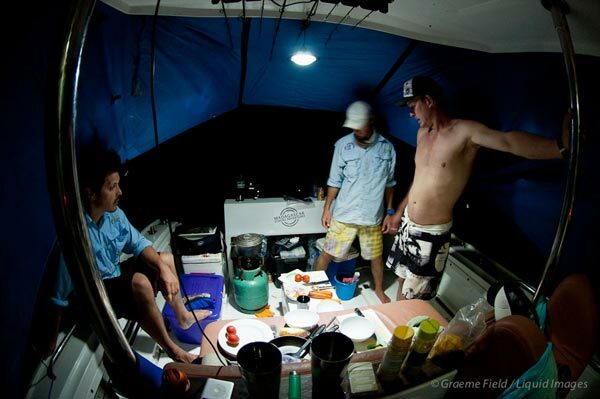 The rest of the time was used up charting and mapping the drop-offs and reefs on our GPS, and finalising our fly camp that we are setting up in order to easily access the fishing in this area. 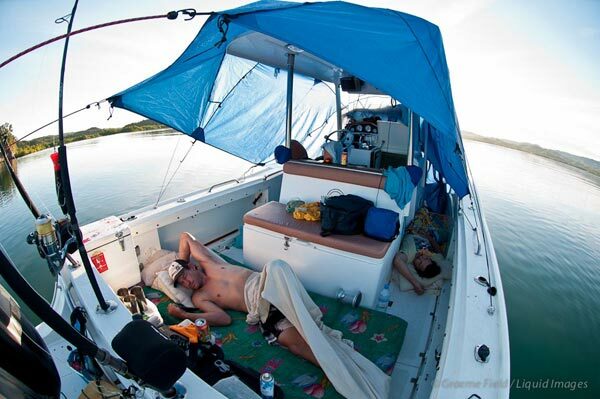 We have a great set up, awesome anchorage and comfortable camp from which you can fish on foot in the early morning or evening. 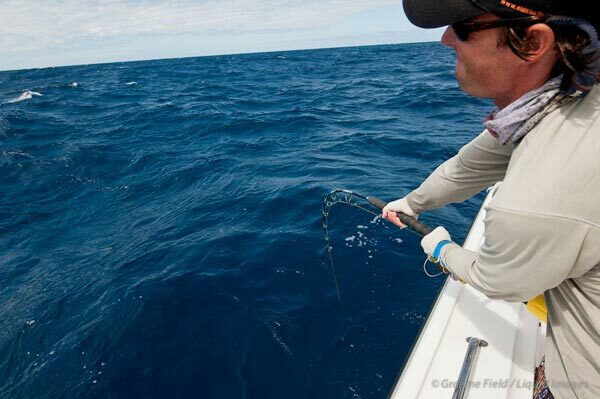 We didn't really look for billfish, but we did spot a couple of sailfish leaping around, and we had a pretty big marlin smash a rooster popper of the deep drop off. 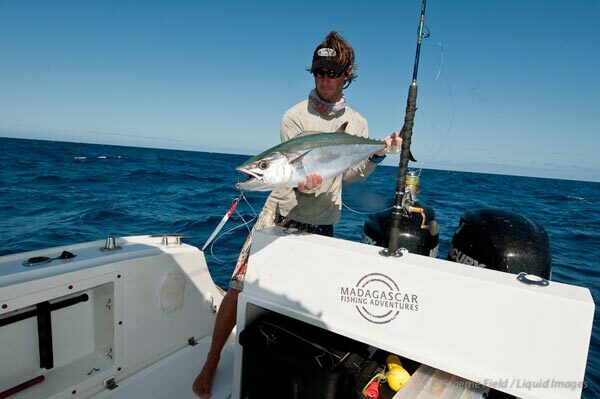 This is prime billfish area, and with our boat set up for marlin, and a guide who is a sailfish-on-fly-catching-machine, King Julien is quickly racking up the number of billfish successfully released (mostly on fly and stickbaits). 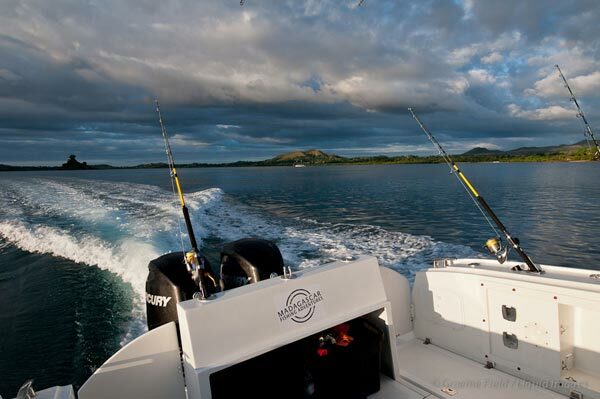 After a couple of days back at our base on Sakatia Island (Ankofiamena Bay), we prepped the boat and headed off early the following morning for legendary Castor Banks. 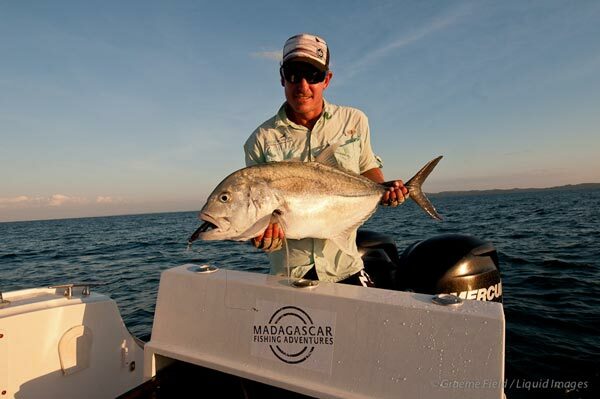 Resisting the urge to head straight for one of our known marks that consistently produce good fish, we stuck with the exploratory attitude and headed for some good looking drop-offs we had been eyeing out on our GPS map for a while. And did we get it spot on! 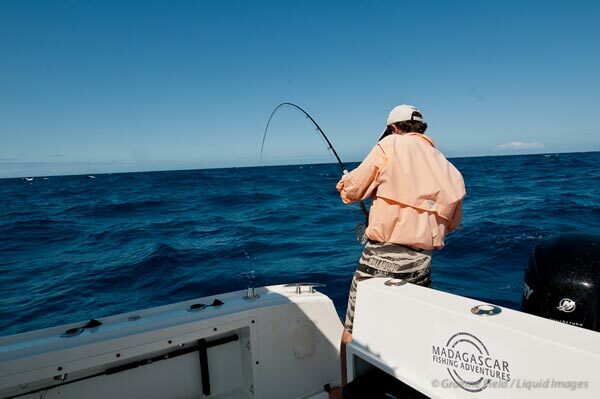 Nothing short of chaos erupted as all of us immediately hooked into big dogtooth tuna and got our butts properly kicked. After the first drift, everyone had been broken off, even on the big rods. Frantic tacking up followed by more hook-ups, and more hanging on for dear life, and more breakoffs ensued before Brandon finally landed a baby doggie of about 30 lbs. We drifted this area the entire day, catching a multitude of big grouper, snapper and Bluefin kingfish, as well as countless smaller dogtooth tuna. Unfortunately the big one got the better of us, and showed exactly why they have such a tackle-busting reputation! 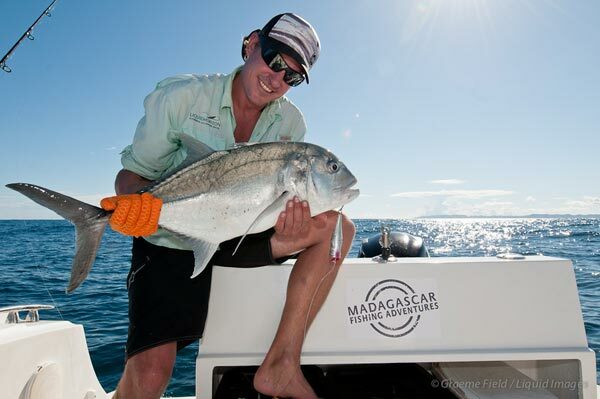 There weren't any GT's around, but it was their low season, and if our other reefs out here are anything to go by, these new marks will be thick with GT's in 2 months time. We did have a few shark problems, but sharks is a good sign of a healthy reef and is also a seasonal thing as we haven't had any shark issues at Castor at any other times of the year. We returned home battered and bruised, but it was a fitting end to a great trip. We made some fantastic discoveries and added even more great value, variety and adventure to our fishing portfolio in Madagascar. 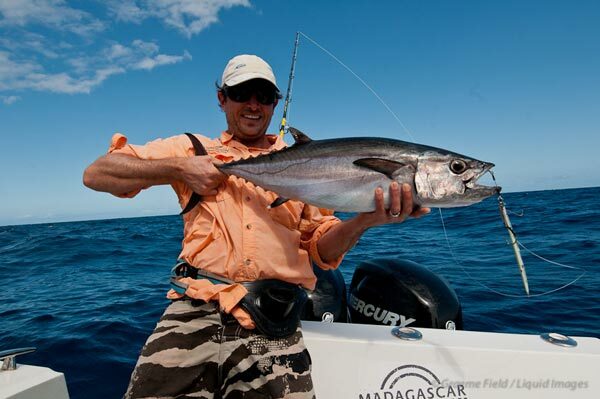 The great thing is that we have options and good fishing not only for every angling discipline, but for every month of the year (barring cyclone season). Our standard package now includes 2 nights at either one of our fly camps, as well as a day trip to Castor Banks. 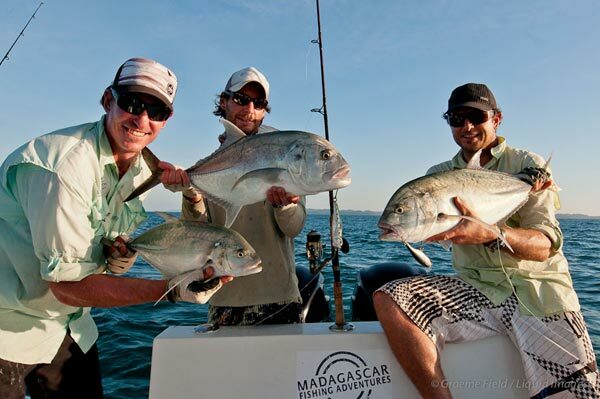 This itinerary will give all anglers of any experience a great Madagascan fishing adventure!